Here’s another idea: Head to The Center for College Affordability and Productivity, which is the think tank that generates Forbes magazine’s annual college rankings. 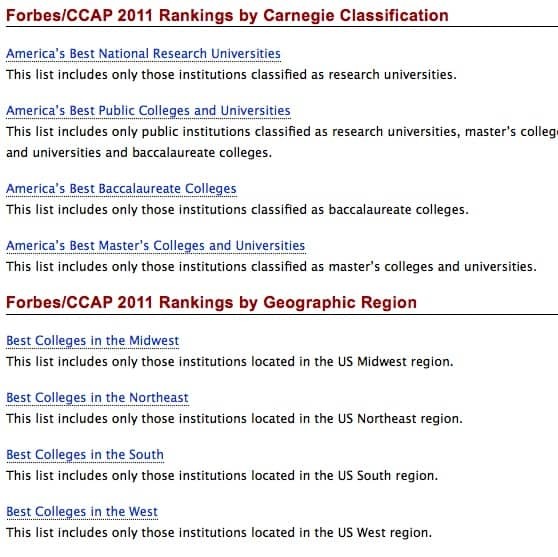 On the center’s site you can find the schools that Forbes thinks are the best, as well as other lists that are broken down by region, type of schools and more. Forbes ranks 650 colleges and universities. Forbes magazine’s rankings are imperfect (all rankings are), but they represent an improvement over US News’ scorecards because the magazine at least makes a stab at addressing what kind of return on investment that students and their parents can expect from schools. Forbes’ rankings aim to measure the sort of educational experience that students are receiving, as well as their success in obtaining jobs after graduation. Forbes also evaluates schools based on how much debt their students must grapple with after graduation. Strangely enough, US News doesn’t use any of these measures. Post-graduate success (Graduates’ salaries compiled by PayScale.com. Here is where you can find an exhaustive explanation of the methodology. By the way, the University of Minnesota at Morris is a public liberal arts college which gives in-state tuition ($12,o91) to all students! The school in Morris edged out the University of Michigan at Ann Arbor. Here are all the ways the Forbes slices and dices the master list. This is a screen shot so you will have to go to the site to access these lists. The lists that I particularly like are the ones broken down by region because most students do not stray outside their region. I’m using the Midwest list as example because these schools are often a better value than those on the coasts. Also, there isn’t as much competition to get into wonderful schools in the Midwest because few families outside the region even know about them! It’s the same story in the South. 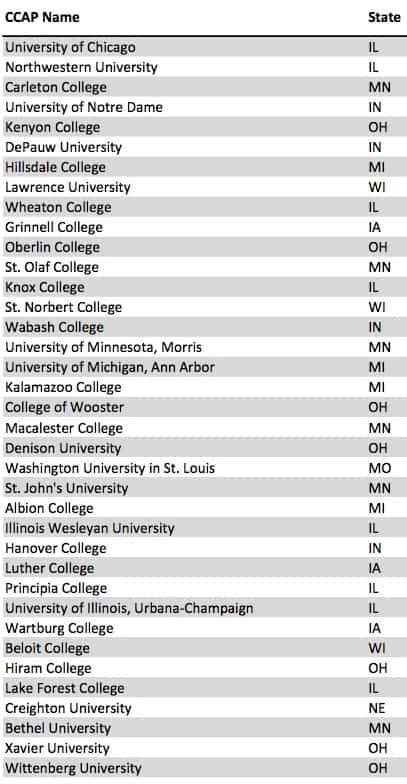 I bet it didn’t take you long to stop recognizing the Midwestern schools on this list. And that’s why I shared it. There are amazing schools in this country that just need discovering. What you should resist doing is believing the No. 1 is better than No. 19 and No. 25 has to be than No. 50. Just use these lists as idea generators! If you’re a real numbers person, you might also want to check out the center’s component rankings list, where you can tease out such things as the schools where the students are happiest with the teaching, earn the highest salaries upon graduation and more.